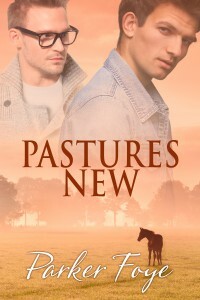 Pastures New is released today! A 15k novella, this is part of Dreamspinner’s Daily Dose 2016, A Walk on the Wild Side. Every story features shifters! Which is utterly my jam (this will surprise precisely no one). Am stoked to read everyone’s stories throughout June! After a successful career as Illustrious Ruckus, three-time winner of the British Open, James Kirby has hung up his saddle. His experience as a horse in the eventing world doesn’t exactly translate to two legs, and he’s struggling to move on. James’s quiet days at the family farm with his sister, Matilda, are interrupted by Archie Ievins, a sports journalist visiting to interview Matilda and snap a few photos of Illustrious Ruckus. Archie quickly endears himself to the family and to “Ruckus,” and James falls head over hooves—only to be brought up short when his ex-boyfriend threatens to expose James’s secret. How can James start something new when he has four legs threatening to come out of the closet?